✔ No Water Softener. Sparkling glasses with improved beer heads. ✔ Stainless Steel Components. For ultimate durability. ✔ Eco-Friendly. Pre-configured for Enviro Clean Pro detergent. 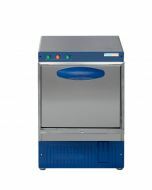 The Enviro Clean Glasswasher 400mm is the only commercial glasswasher that is configured out-of-the-box for automatic operation with Enviro Clean Glasswasher Detergent. A revolutionary water treatment that protects the environment and ensures sparkling clean glasses every time, without the need for a water softener. 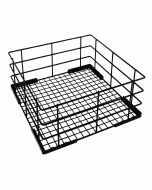 This medium sized glasswasher can wash up to 30 rack/hour and is suitable for a standard 400x400mm basket, with a clear-entry height of 310mm for tall beer glasses. With a fixed two minuite wash cycle, it delivers a guaranteed hygienic rinse at 85c on every wash and is WRAS approved for use in commercial premesis. 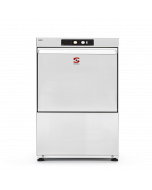 Unlike many competitor machines, the Enviro Clean Glasswasher is manufactured entirely from stainless steel including interior cabinet, boilers, threads, wash arms, plugs and jets. 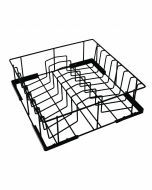 This design helps to prevent the most common breakdowns and ensures a durable glasswasher that is well suited to long-term commercial use. In the field, glasswashers often break down due to lime scale build up (either due to lack of water softener replenishment, particularly in hard water areas or where no water softener is installed). The Enviro Clean Glasswasher eliminates this problem by removing lime scale before it gets the chance to form. Operators can save on the initial outlay of a water softener and continuing saving by never having to refurbish glasses, replenish salt or clean the inside of their machine again. The specialist environmentally friendly chemical doses directly into the boiler and by utilising only natural ingredients, there can be no contamination on glassware. This unique glass washing process ensures the Enviro Clean Pro Glasswasher delivers the best beer taste and presentation in the world. Publicans can guarantee improved carbonation, increased beer head retention and fantastic lacing. No detergents, rinse aid or water softener required. Just use Enviro Clean Glasswasher Detergent. 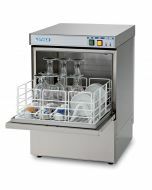 Uses up to 5 times less rinse aid and detergent than traditional glasswashers. All-stainless-steel construction, including stainless steel internal components. 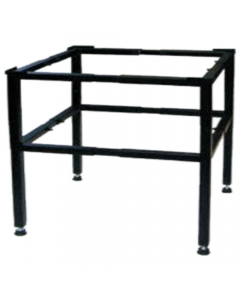 We believe in the reliability of our products and provide a 3 Year Warranty as standard. 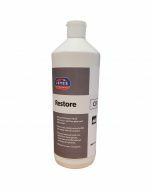 The bio-degradable formula is dosed at a much lower concentration, completely replacing your traditional detergents and rinse aid. One 5L tub typically lasts 5 times longer. 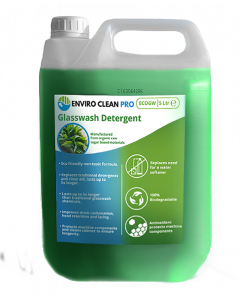 Enviro Clean Pro Glasswashers have been designed in consultation with the UK’s leading publicans and brewery chains to go hand-in-hand with the Environmentally Friendly Enviro Clean Pro Glasswash Detergent. 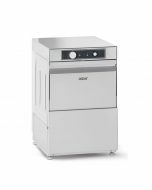 Manufactured from a Fully Bio-Degradable Formula, this detergent allows Enviro Clean glass washers to operate without traditional detergents or water softeners, delivering huge cost-in-use savings for operators. Utilising only Natural Ingredients, Enviro Clean Pro Glasswashers do not contaminate glasses with powerful chemicals and caustic. This ensures the Best Beer Taste and presentation, with fantastic lacing and Improved Beer Head Retention. 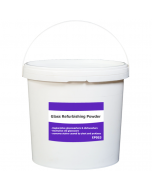 Furthermore, the active ingredient in Enviro Clean Pro Glasswash Detergent eliminates limescale, protecting machine components and ensuring longevity. 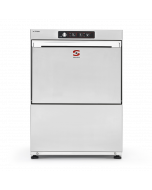 A promise of quality that is backed by a 3 year commercial warranty as standard. All Enviro Clean Pro products are backed by a Nationwide Service and Support team, dedicated to ensuring the best possible aftersales care. Trained engineers cover your machine and can offer telephone support, on-site visits and access to a full UK parts stock.